Code Pink shows its support for the (Al-Qaeda) troops. The Left’s favorite antiwar group is now openly supporting Al-Qaeda. The Jawa Report– Noblesse Oblige – and Zombie Time all have photos of the Left’s favorite antiwar group- Code Pink -in action this week in Berkeley. Since they were supporters of Saddam Hussein before the war, this really shouldn’t come as that big of a surprise. 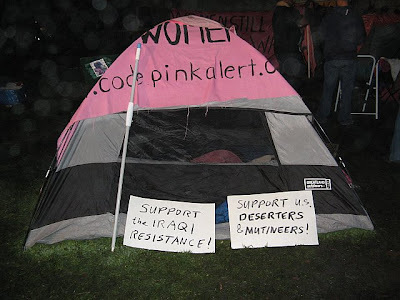 Code Pink is also the group that mocked wounded soldiers during their weekly protests at Walter Reid Army Medical Center. CODEPINK co-founder Gael Murphy and DC coordinator Allison Yorra met with Congressman John Murtha (D-PA) to thank him for his courageous stand on Iraq which was identical to his courageous stand on Mogadishu. 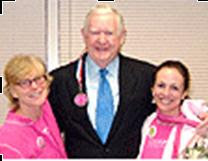 Murtha was awarded his “Pink Badge of Courage,” Code Pink’s top honor, in 2006. More… Kyle-Anne Shiver at The American Thinker believes that Code Pink’s hatred for Bush and the Marines is about to backfire.